This filmed performance of renowned historian Howard Zinn's stage play Emma dramatizes the life of Emma Goldman, the famed anarchist, feminist, and free-spirited thinker who was exiled from the United States because of her outspoken views, including her opposition to World War I. Filmed live in 2005 at the Byrdcliffe Theatre in Woodstock, New York, with Zinn in attendance, the play draws on Goldman's influential autobiography, speeches, and political writings to trace her emergence as one of the foremost radical intellectuals and dissident activists in America in the early part of the 20th century. Emma shows us why Emma Goldman was not only a remarkable historical figure but a woman whose fierce wit and political courage continue to resonate today. This performance of Emma was directed by Bruce Grund, and filmed by Malachi Roth. Includes a Q & A after the performance with Howard Zinn and others. Duration: 1 hour 54 min. Howard Zinn (1922-2010) grew up in Brooklyn in a working-class, immigrant household. He was a shipyard worker as a teenager, then flew bomber missions during World War II, before going onto become one of America's foremost historians and activists. Among his many acclaimed books was the classic A People's History of the United States, described by Library Journal as ""a brilliant and moving history of the American people from the point of view of those ... whose plight has been largely omitted from most histories."" "The first act of Emma, Howard Zinn's play about Emma Goldman, is a small miracle. Here is a drama that holds down the heroics, polemics and didacticism to which works about heroes and heroines are prone. True, Emma is idealized; she is loving, honest, selfless, daring, but she is also human and believable." "Great to see the passions and activism of Emma Goldman, one of America's strongest fighters for social justice, introduced to a new generation. We need her voice again." "Howard Zinn's Emma brings to life the human stakes in revolution in early twentieth century America, the violence of strike-breaking, and the bleak conditions under which people laboured. In its central character of Emma Goldman, it highlighted the gendered character of both oppression (unequal pay and conditions) and the sexism of the anarchist movement. Against the odds, Goldman rises to prominence as a renowned speaker, and the theatre piece portrays her combination of determination and openness extremely well. Star turns in Emma are of Johann Most and Ben Reitman, who light up the stage; and the former's speech towards the beginning of the piece would be an interesting excerpt for teaching (in terms of rhetoric and the meaning of violence). Similarly, arguments between Berkman and Goldman on the significance of beauty in living revolutionary ideals in the present might generate interesting discussion." "This is the best rendition -- on every level -- of Zinn's play (I have seen many). I applaud you for working so artfully to bring this gem of political theater to a larger audience." "With verve, wit, and nuance a young cast led by Naomi Hard renders palpable the life and politics of Emma Goldman, the fiery anarchist, who championed workers rights and women equality, and scandalized American society whether in her advocacy or free love or her anti-war activism. Howard Zinn's play excels in interweaving the personal and the political, Goldman's radicalism and the challenges she faced in pursuing her convictions." 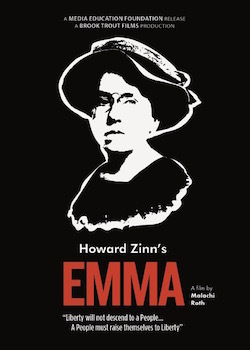 "Howard Zinn's play Emma brings to life the challenges and triumphs faced by anarchist Emma Goldman, the 'Mother of the Cause.' Zinn brings his usual exceptional insight to bear on the life and times of Goldman and her colleagues, capturing the essence of the early anarchists and their idealism, as they dreamed of a better world and sacrificed themselves for the Cause and for humankind." "In the play, Emma Goldman reminds us that patriotism is love of one's country and not love of one's government. The continued relevancy of this truth is reason enough to see this play about a tough, powerful woman." "Emma is a fascinating slice of little-known history that feels timely in our present political climate." "Step outside of the political comfort zone of complacency and the entertainment comfort zone of escapism and enter the aesthetically vital zone of confrontational creativity and contemporary consequence. ... Emma proves that historical eye and ear candy can be emotionally delicious as well as fundamentally nutritious. This is one of those 'here's something you've been missing' experiences that will inspire you to look at the topic and your world with a greater degree of scrutiny and passion. Do not miss this critically compelling theatrical triumph." "When [she] delivers the rousing words that made the firebrand Goldman a prized speaker in the American union movement (as well as a national threat worthy of the attention of J. Edgar Hoover), it feels like the audience in the theatre might get out of their seats and riot. And why not?"